The Star Wars galaxy would be a much different place if not for a lot of good people acting on their good intentions. Most of us have probably heard that the pathway to Hell is paved with good intentions, but good intentions aren’t the problem and they aren’t themselves bad things. The problem comes when we are satisfied with our good intentions and don’t act on them. What would have happened if our favorite Star Wars characters would have been content with simply having good ideas? Leia is one who puts her credits where her mouth is. How negatively affected would the galaxy have been if Leia had wanted to go back to get Luke at Cloud City in The Empire Strikes Back, but didn’t? Luke may have died or been captured by the Empire and there would have been very little chance of Darth Vader’s redemption or the Empire’s defeat in Return of the Jedi. Luke gets most of the credit for saving the galaxy, but Leia is the unsung hero. Even before that, what if in A New Hope Leia hadn’t put the stolen Death Star plans into R2-D2 on the Tantive IV and sent him down to Tatooine? Who knows what would have become of the Rebellion? Luke may have never even gotten off of Tatooine. There would have been no reason for Obi-Wan to go to Alderaan and, therefore, no reason for him to call Luke to action. What if in The Clone Wars Ahsoka Tano had not actually walked away from the Jedi Order, but had only considered it? She may have been killed in Order 66 and would have never become Fulcrum in the Rebel Alliance. Without her skills and help, the rebel cells may have never formed the Alliance and there would have been no one to stand up to the Empire. By leaving the Jedi Order, Ahsoka was able to gain a greater perspective on the galaxy, continue to act on her good intentions, and not be held back by the dogmatic Jedi. Some may argue that she could have kept Anakin from turning to the dark side if she hadn’t left, but if his wife and Obi-Wan couldn’t stop Anakin it is not absolute that Ahsoka could have either. Her talents were better used elsewhere. In Rogue One, Galen Erso, in a way, allowed himself to become a target of the Rebel Alliance by leading the creation of the first Death Star, but by immersing himself in building the Death Star he was able to plant a trap for the rebels to exploit. Many of the rebel leaders at first didn’t trust Jyn Erso, Galen’s daughter, when she told them that Galen had set a trap. Also, some leaders of the fledgling Rebel Alliance didn’t want to engage the Empire even though their intentions were good, and it took Jyn taking matters into her own hands to get Alliance to act. Jyn followed Galen’s example and acted on her own good intentions to steal the Death Star plans from the Empire, which led to the destruction of the Death Star. Jyn and Galen both died in order to save many other lives. There is no more selfless action to take. Those characters in Star Wars who did act on their good intentions did so to help benefit many others and not just themselves, and they did so at great risk to themselves and people they cared about. Qui-Gon Jinn probably knew that he would not be treated favorably by his fellow Jedi each time he tried to help “another pathetic life form,” but he also knew that his actions would benefit the galaxy as a whole and he was willing to endure others looking down on him. What if Luke had done as Obi-Wan had suggested and killed Darth Vader in Return of the Jedi? Luke may have been converted to the dark side and his hard work and love for his father would have been for naught. Luke wanted to redeem his father and defeat the Empire and he was willing to sacrifice himself to achieve his goals and save others. And what if Finn had not seized his opportunity to defect from the First Order by helping Poe Dameron escape? Rey may have never realized her Force abilities. But what about Anakin Skywalker? Didn’t he have good intentions of saving his wife Padmé from certain death during childbirth? It definitely wasn’t bad for Anakin to want Padmé to live, but not if saving her meant that he had to kill innocent younglings and many Jedi to do it. Unlike Leia, Ahsoka, and others, Anakin acted out of selfishness and was willing to sacrifice many others for his benefit. I believe Leia and Amilyn were both right in what they said in Leia, Princess of Alderaan. When someone has good intentions they are probably buoyed up by the Force, but if the Force still allows for free agency then it must ultimately be the person who decides to act. Later in Leia, Princess of Alderaan, Amilyn told Leia, “A few weeks ago, you made me realize that intention alone isn’t sufficient. Goodness is proved through action rather than ideas.” It may be impossible to know how many people Leia positively influenced with her actions against the Empire and eventually the First Order, but we know Amilyn was one of them and I would bet there are many more. Thanks so much for taking action and reading my blog! 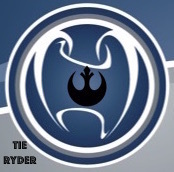 Feel free to contact me at ryderw@coffeewithkenobi.com, follow me on Twitter @ryderwaldrondds, or leave a comment below. Also, remember to listen to Coffee With Kenobi each week! Great article! This is a very interesting topic, and opens the door for all sorts of discussions on intentions being linked not only to the Force itself, but also to the individual Light and Dark sides of it.